The GTX Titan for gamers. The Titan LE. Titan’s li’l brother. Call it what you like, the new GTX 780 is the top of the GTX 700 series tree and contains nearly all the goodness that made the GTX Titan such a desirable graphics card. So yes, Nvidia have taken the plunge and opted to drop its new generation on us. As we have already mentioned, the new GTX 700 series is essentially still using the same technology that got us through the last generation, except this time around it is reaching higher up the GPU ladder and pulling the tech down into different price points. Or, as is the case with this GTX 780, creating whole new price points with which to jam its new cards into. At £550 Nvidia has upped the ante at the top-end of the new graphics card series and seems to be challenging AMD to step up to the plate and offer some competition. Though really all it’s doing is throwing a high-priced graphics card, which has no real competition, into a space where it’s going to surely generate huge margins for the company. And that’s the starting price too – you can bet there’s going to be some £600 overclocked SKUs doing the rounds very soon after launch. 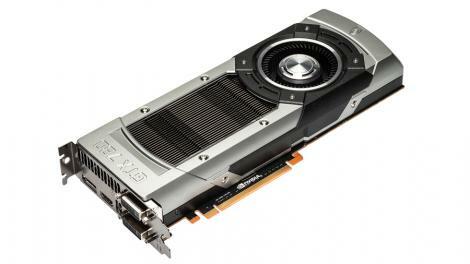 And despite the fact Nvidia has used the exact same Titan-esque surrounds for its GTX 780 and GTX 770 cards, it is allowing its partners to produce cards with third-party cooling arrays strapped to them. At the time of writing Nvidia is still not allowing companies like Gigabyte to drop homespun coolers onto its ultra-enthusiast card. We know we shouldn’t keep on using that moniker, but it really does fit the impressively powerful GTX 780 perfectly. The GPU is still the same GK 110, though this time with 2,304 CUDA cores as opposed to the 2,688 unified shaders that made up the Titan’s chip. Interestingly though, while on the surface it looks like Nvidia has simply lopped off a single graphics processing cluster, it is actually cutting out three of the fifteen SMX modules wherever they aren’t functioning so well. That means each GTX 780 can have either four or five GPCs depending on whether all three of the disabled SMX modules appear in the same GPC. There’s already a redundancy built into the GK 110 cards to allow for a failing SMX module – the top Tesla K20X pro-card and the GTX Titan are both running without one of the full complement of fifteen SMX modules. With the GTX 780 then, Nvidia has something to do with any GK 110 chip with up to two more failing modules. That’s not to say every GTX 780 is housing a chip not strong enough to make it into the top two cards, but if it’s true that Nvidia could sell every Titan it makes, it’s not that ridiculous a conclusion to make. One other change to note from Titan to GTX 780 is the fact Nvidia has disabled the double precision units in its GK 110 chip. The reason it’s done this is fairly obvious – a good many of the people buying a Titan were amateur/small-scale/bedroom renderers who wanted the performance of a professional class Tesla K20X without having to fork out £2,500 for the privilege. Many of the Titans weren’t playing games. That versatility is gone with the GTX 780 and it’s only raison d’etre then is gaming. How it’s done this though is currently unknown, but Nvidia itself said to us it wouldn’t be surprised if some enterprising hacker managed to turn them back on. And that would then make the £550 GTX 780 an absolute bargain as it can already happily hold its own against the GTX Titan, only dropping around 10% in terms of gaming performance. Throw in a little light overclocking and you can achieve benchmark performance that actually beats a stock-clocked Titan. Compared with the GTX 680 it’s almost night and day, with the GTX 780 posting up to 70% better performance in some cases. Thanks to recent driver improvements it can also boast a similar lead over AMD’s top single GPU graphics card, the HD 7970 GHz Edition. AMD’s top card, the full fat HD 7990 though is still capable of stretching out a decent lead over the GTX 780, even in overclocked trim. That said it’s still suffering from the vagaries of multi-GPU design and a constant, lingering distrust from the masses over AMD’s CrossFireX drivers. While we’re comparing it with the likes of the HD 7990 and the GTX Titan you can look at the £550 price tag and think that such a significant saving for so close performance numbers makes it good value. And that’s an impressive feat given just how expensive it is when you pull your head out of the ultra-enthusiast market. The top-end graphics cards of a new generation have always been expensive but generally they have some competition, something to fight against. The GTX 780 has nothing. It’s been priced so that it stands alone in a no-man’s land between the ‘normal’ graphics cards of the existing generation and the aspirational, ultra-enthusiast cards. As good as this little Titan-lite card is it’s still phenomenally expensive. And the staggering thing is you can drop £550 and still not be able to claim you’ve got ‘the fastest’. At best you’ve spent a lot of money on a second-tier GPU. Forgetting about our frustration at the high price tag, the actual gaming performance is stellar. The GTX 780 gets mighty close to the power of the Titan at stock speeds, and when you start pushing it via overclocking you can actually best the more expensive card in a lot of benchmarks. The dual-GPU HD 7990 still has the raw performance lead, but you will have to make a pact with the CrossFireX devil for those sorts of numbers. That, sadly, is the legacy of the GTX Titan – the top graphics card in this GTX 700 series is still not the fastest card in Nvidia’s lineup. We all knew this was going to be the case at the launch of the Titan, but the reality of the situation must still be a little galling for anyone dropping that much cash on the second place card. And that’s us being generous and not including the dual-GPU GTX 690 in the equation. Where the GTX 780 is going to win out though is for system integrators. As a drop-in upgrade it’s going to be tough to part with £550 for the card on its own, but as part of a full rig the GTX 780 is going to be able to power some fantastically performing gaming PCs for a good chunk less than a Titan machine. But while the GTX 780 certainly contains a fabulous beast of a GPU, we’ve got to have a consideration for the cost. The GTX 780 then is a great, great-looking graphics card, with performance to burn, but at a price that’s going to make people think long and hard about upgrading.